The Mississippi River Ship Channel could be the first port complex on the Gulf Coast to reach a depth of 50 feet now that the US Army Corps of Engineers has signed the Director’s Report. Elected officials and industry leaders have long worked to increase the channel’s depth to 50 feet, which is the same depth of the expanded Panama Canal. In signing the report, Corps of Engineers Director of Civil Works James C Dalton stated the project is “economically justified and environmentally sustainable” and recommended approval of funding for the project. The project will provide a draft of 50-feet from the Gulf of Mexico upriver 256 miles to the Port of Greater Baton Rouge. In addition, the material dredged from 30 miles of the project near the mouth of the Mississippi River will be used to create an estimated 1,462 acres of new marsh habitat. In accordance with cost sharing provisions of Section 101 of the Water Resources Development Act the federal share of the project would be USD $118.1 million, while the estimated non-federal share would be $39.4 million. The current ship channel is maintained to 45 feet. The Corps’ report identified the benefit-to-cost ratio at 7.2 to 1, calling the project one of national and international significance. 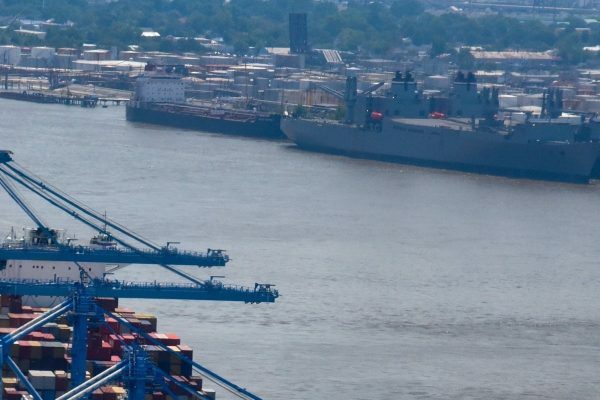 The Lower Mississippi River is home to four of the nation’s Top 15 ports by annual tonnage (Port of South Louisiana, Port of New Orleans, Port of Greater Baton Rouge and Plaquemines Port, Harbor and Terminal District), moving more than 500 million tons of cargo, including 60 percent of the nation’s grain and is connected to 14,500 miles of inland navigable waterways.